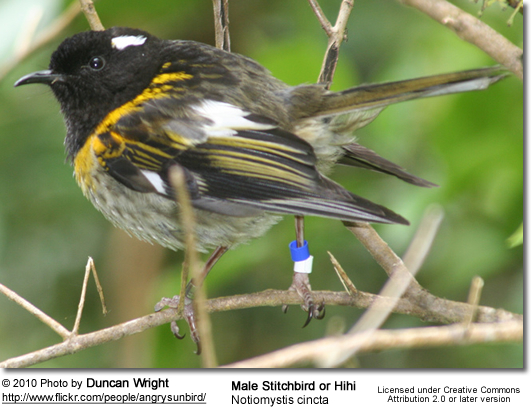 The Stitchbird or Hihi (Notiomystis cincta) is a rare honeyeater-like bird endemic to the North Island and adjacent offshore islands of New Zealand. It became extirpated (extinct) everywhere except Little Barrier Island but has been reintroduced to three other island sanctuaries and two locations on the North Island mainland. Its evolutionary relationships have long puzzled ornithologists. The Stitchbird is a small honeyeater-like bird with a dark velvety cap and white ear-tufts. Males have a yellow band across the chest separating the black head from the rest of the body, which is grey. Females and juveniles are duller than males, lacking the black head and yellow chest band. The bill is rather thin and somewhat curved, and the tongue is long with a brush at the end for collecting nectar. Stitchbirds are very active and call frequently. Their most common call, a tzit tzit sound, is believed to be the source of their common name, as Buller noted that it "has a fanciful resemblance to the word stitch". They also have a high-pitched whistle and an alarm call which is a nasal pek like a bellbird. Males give a piercing three-note whistle (often heard in spring) and a variety of other calls not given by the female. Research has suggested that they face interspecific competition from the Tui and New Zealand Bellbird, and will feed from lower-quality food sources when these species are present. The Stitchbird rarely lands on the ground and seldom visits flowers on the large canopy trees favoured by the tui and bellbird (this may simply be because of the competition from the more aggressive, larger birds). Their main food is nectar, but the Stitchbird's diet covers over twenty species of native flowers and thirty species of fruit and many species of introduced plants. Important natural nectar sources are haekaro, matata, puriri, rata and toropapa. Preferred fruits include Coprosma species, five finger, pate, tree fuchsia, and raukawa. 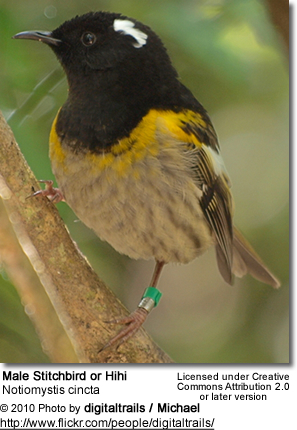 The Stitchbird also supplements its diet with small insects. The Stitchbird nests in holes high up in old trees. They are the only bird species that mates face to face, in addition to the more conventional copulation style for birds where the male mounts the female's back. The Stitchbird was relatively common early in the European colonisation of New Zealand, and began to decline relatively quickly afterwards, being extinct on the mainland and many offshore islands by 1885. The last sighting on the mainland was in the Tararua Range in the 1880s. The exact cause of the decline is unknown, but is thought to be pressure from introduced species, especially Black Rats, and introduced avian diseases. Only a small population on Little Barrier Island survived. Starting in the 1980s the New Zealand Wildlife Service (now Department of Conservation) translocated numbers of individuals from Hauturu to other island sanctuaries to create separate populations. These islands were part of New Zealand's network of offshore reserves which have been cleared of introduced species and which protect other rare species including the Kakapo and Takahe. Currently the world population is estimated to be between 500 and 1000 adult birds, surviving on Hauturu (Little Barrier Island), Kapiti Island, Tiritiri Matangi Island, Mokoia Island in Lake Rotorua, the Karori Wildlife Sanctuary and the Waitakere Ranges. The Tiritiri Matangi population is growing slowly but more than half the chicks that hatch there die of starvation due to the lack of mature forest, most of the island having been revegetated only since 1984–1994. Only the Little Barrier Island population is thought to be stable as of 2007. This species is classified as Vulnerable (D1+D2) by the IUCN. This classification means that there are less than 1000 mature birds, and that the species was found in five locations only. Should the number of self-supporting populations increase and the species flourish, it would likely be downgraded to Conservation Dependent. 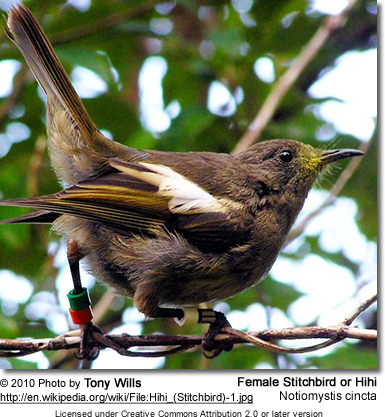 In 2005, 60 Stitchbirds were released in the Karori Wildlife Sanctuary near Wellington and in October that year, three Stitchbird chicks hatched there, the first time for more than 120 years that a Stitchbird chick had been born on mainland New Zealand. The hatchings were described as a significant conservation milestone by sanctuary staff who were hoping further chicks would be born there. In (local) autumn 2007, 59 adult birds from the Tiritiri Matangi population were released in Cascade Kauri Park, in the Waitakere Ranges near Auckland and by the end of the year the first chicks had fledged there. 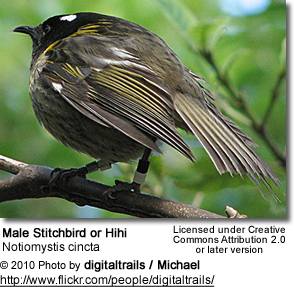 The Stitchbird was originally described as a member of the primarily Australian and New Guinean honeyeater family Meliphagidae. It has remained classified as such until recently. 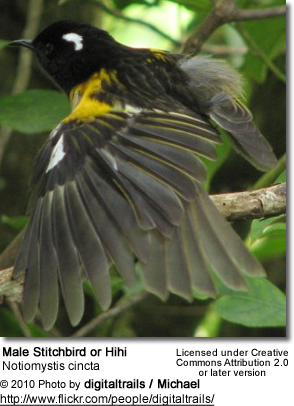 Genetic analysis shows that it is not closely related the honeyeaters and their allies and that its closest living relatives are within the endemic New Zealand Callaeidae. 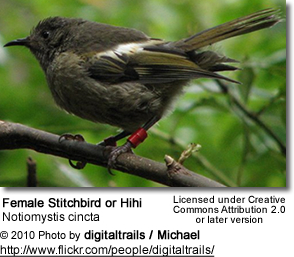 In 2007 a new passerine family was erected to contain the Stitchbird, the Notiomystidae.